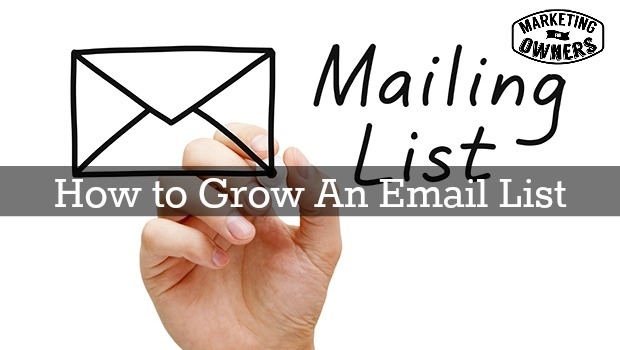 Growing an e-mail list, is one of the most common questions I get asked all the time. How do I grow an e-mail list? How do I start? How do I expand it? For most people, when they’re starting a marketing system, they start with hardly anything or nothing. So, how do you grow from zero? Especially, when you hear about people who talk about their e-mail list of seven hundred thousand, eight thousand, five thousand or one million. Some do have them like that. They’ve been building them for years and quite often, they’ve been paying but you’re talking, you’re listening to expert Internet marketers who’ve done this for years, who their in the early days, who continuously do this. They spend a lot more money than you think doing it but a lot more effort then. How do you start when you’ve got nothing? So, first thing is the website. Your website needs to be set-up properly so that when anyone comes to any page of your website, there is a lead capture, meaning you’re going to get their e-mail address. It needs to be set-up with an e-mail service provider. This is different to your Internet service provider. So, what I’m talking about here is someone like Aweber or MailChimp or Infusionsoft or Get Response or the people like that. We use Aweber. It’s our favorite. We also use MailChimp on a couple other websites but Aweber is my absolute favorite. So, if you go to our start here section we have some great tools listed and Aweber is one of them. I think you get a free trial for a month so you can just give it a go and see what it does. So, get a lead capture form on your website and on every page. Secondly, do not just say sign up for a newsletter or sign up to get our updates. People aren’t interested. In one of my recent e-mails, podcast on a weekend challenge, I said: “Unsubscribe from all the rubbish that you’re not reading.” You want people to want to get valued. So, give them a choice. So, they’re going to give you permission to market to them which means giving their name and, then e-mail. You, in exchange, want to give them something of value, a bribe, a lead magnet. Now, that can be a course or it can be an e-book or it can be a report or it can be a white paper or it can be daily tips or it can be anything. It’s going to be specific to your trade. You need to try. Don’t think you can hit it out at the park with the first one. You may spend all your effort doing it and it maybe, just slightly the wrong thing. The one that works for us especially is if you go to marketingforowners.com/71 or if you go to the website and look at the blog or the podcast pages, you’ll see in the right hand side bar, there is an image for it. It’s a report of all the tools we use. Sign up for that and see how we do it. Now, that gets a lot of sign ups everyday but we put it in various places. There are other ways. If you’re in the USA, you can actually text 33-444 and text 71tools, no spaces and you’ll even get it in your e-mail inbox via that, that clever. We don’t have to see, don’t worry. So, a good lead magnet, you need to give value. There are lots of good lead magnets. You need to give them something specific for them. So, the next thing is you need to know who your target audience should be because you need to be talking just to your target audience. If you’re just trying to build a massive e-mail list with insignificant people, you’re going to waste your time and you’re going to waste your money. Why do you want to talk to somebody about a subject they’re not interested in? It’s not a numbers game. You’ll probably not going to publish how many people on your e-mail list. If you got two hundred on your e-mail list, you can sell good products to them. I think it’s David Simon Garland said that that’s in his first offer, he made something like five or eight thousand dollars of a product with an e-mail list of two hundred because he kept them engaged and gave them value. Remember that’s the second ‘P’. So, the first P, your presence. Second P, your potential customers you need to influence. Third P, permission. The next one is I’m just going to go back to value, as well as getting them on your e-mail list. You need to keep them on your e-mail list. So, you need, what’s called, lead nurture. You need to lead that via e-mail. Now, this is where we go from the third P, permission to the fourth P of purchase making, their first purchase. This is the period where you get them to know like and trust you. Do not hit them with a sale. So, every e-mail you send is going to give them something of value. Explain a case study. Explain what you do. Explain how you got to where you are. Explain something that teaches them a lesson where after reading it, they are better informed than when they started. Something that they may, well, tell their friends they ought to get. Every now and again, of course, you can pitch them a sale but don’t go all out on sales. It’s not about sales. You’ve got to build up the trust. Unless you serve a short offer thing, I’m going to suggest you wait until you go to sort of six or seven or eight, maybe ten e-mails before you even mention and even, then softly sell. Don’t overtly sell, just suggest it, just hint at it. This approach works. This is the long-term approach, softly, softly. Long-term approach will get you these. Otherwise, to get opt in. So, top of the page on the homepage, again, go to Marketing For Owners. You’ll see one that’s for joining the free owner’s club, that also puts you in to an e-mail list. You can unsubscribe anytime, doesn’t matter, just test it and see what happens. Sign up for other’s people as well by the way, just to see what they do. Top people see what kind of e-mails they send out and see how they deal with it and, then copy their style. Copy the e-mails. We word them for your trade, simple. You can do it with mine, just copy and see what I do. It does work. It would work for you. Do change the words and the links because that won’t work for me otherwise but get a link in the side bar. Get a link in the article. Get a link at the end of the article. If you enjoyed this, enter your e-mail for etc. Also, one that works well for us, if you look at articles I published on a Thursday, quite often they have what’s called the “cheat sheet” or checklist or an add-on. Here’s a quick summary, grab it for free. Those are free, that is also an e-mail opt in. We have e-mail opt-ins all over the place. even on our Twitter profile. Instead of coming direct to the website, you’ll go to a landing page where there’s an e-mail opt in, offers value, same on Facebook. There’ll be a lead capture there. It would be the same on other social media platforms. Don’t go over the top, just do it gently. Once you get a few, you’ll find it will build and, then you’ll find you’ll add more different things. You’ll add a free e-book, a free course, a free tip sheet and all sorts of things to say that it captures everybody and it gradually builds. Don’t look at it week by week. Perhaps, monitor it monthly. Six months, from nothing to six months, you might have five hundred or you might have two thousand or you might have five thousand, depends what kind of business you’re in but once you get, it will grow from that to get your website traffic up. E-mail list should be built from now, not next week, now. Most important thing, this is how you are going to build your business, start and get better, okay? This is a very good podcast. If you run a small business, this is from Steve Chou. It is called My Wife Quit Her Job. When his wife got pregnant, they decide that they don’t want to have their high paid job anymore. She didn’t want to go back to work. So, they decided to start a business from home. They built an e-commerce thing. They actually sell linen. They sell wedding handkerchiefs. Can you believe there would even be a market? Well, they built that and did a hundred thousand dollars in their first year. They’ve done exceptionally well since then. Steve now teaches people how to build an online e-commerce store, excellent business. It’s got more information than anyone I’ve ever seen. He’s a lovely guy. The podcast teaches people how to use his system and how to be successful and it is really worthwhile. 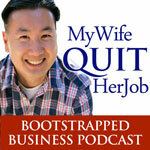 My wife quit her job with Steve Chou. Get at iTunes. Give them a rating afterwards. Give me one too, please. What steps do you need to take to grow your email list?